The Ravager is one of the Creatures in ARK: Survival Evolved's Aberration expansion. Anywhere else, Canis barghest's powerful muscles, wicked claws, and fearsome countenance would put it near the top of the food chain. Yet in these caves, this common, lupine predator resides somewhere in the middle. That said, it is an intelligent hunter with an exceptional ability to adapt. For example, it has learned to utilize the zip lines that survivors have built as a means of travel, all on its own. Remarkable! The strong legs of the Canis barghest make it an effective mount for many survivors, particularly for long distance travel. While other creatures outshine it when it comes to bursts of speed, its stamina and ability to climb across both natural vines and artificial zip lines makes it a highly versatile travelling companion. The Ravager is an aggressive pack animal which usually travels in packs of 3 to 5, attacking most herbivores its size or smaller. Even without a pack, a Ravager can be very aggressive and dangerous, but if there's only one, then they won't get any buffs for being in a pack. This creature is rideable with the use of a saddle. When tamed, the Ravager is a great mount for transport or scouting; it has decent weight, speed, and stamina and it’s capable of climbing up zip lines and vines. The Ravager is a mostly hairless, quadrupedal predator. It has large ears, possibly for hunting at low light levels, and it possesses large teeth and claws for ripping apart prey. 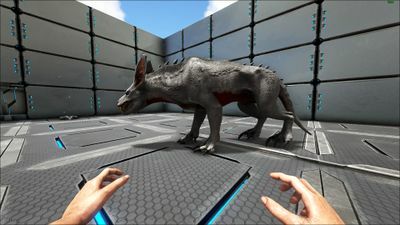 It is around the size of a dire wolf, but has a jump comparable to a thylacoleo although in a more vertical direction for overcoming obstacles. Alphas will have a reddish orange glow around them to distinguish them from the rest of their pack. This section displays the Ravager's natural colors and regions. For demonstration, the regions below are colored red over an albino Ravager. The colored squares shown underneath each region's description are the colors that the Ravager will randomly spawn with to provide an overall range of its natural color scheme. Hover your cursor over a color to display its name and ID. 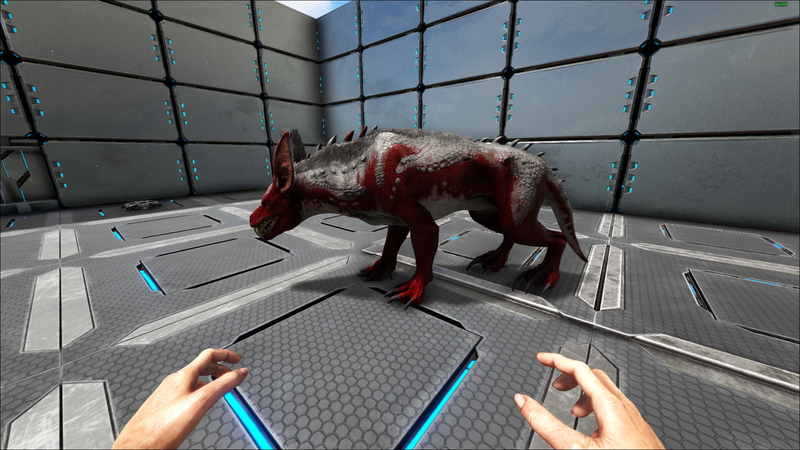 For example, "cheat SetTargetDinoColor 0 6" would color the Ravager's "body main" magenta. This section describes how to fight against this creature. These creatures will attack you if you get too close and are powerful even at low levels, especially with its bleeding attack and the pack buff. They are a common spawn. They will sometimes run away when you approach much like raptors. Keep clear of this creature. If you are going to be attacked however, running into water occasionally will work and will sometimes break aggro, but don't always count on it. Melee combat is not recommended with its Gnash attack. Shooting it instead with a ranged weapon at a distance works best. If you are out at "night" without a capable mount, be very careful, the Ravagers DO NOT glow and the most visible way to spot them in the dark is if you see a pack alpha. They are very fast and will easily run down a low level player. They also hunt in packs (receiving the pack bonus) and have a slow attack that "Gnashes" a player. 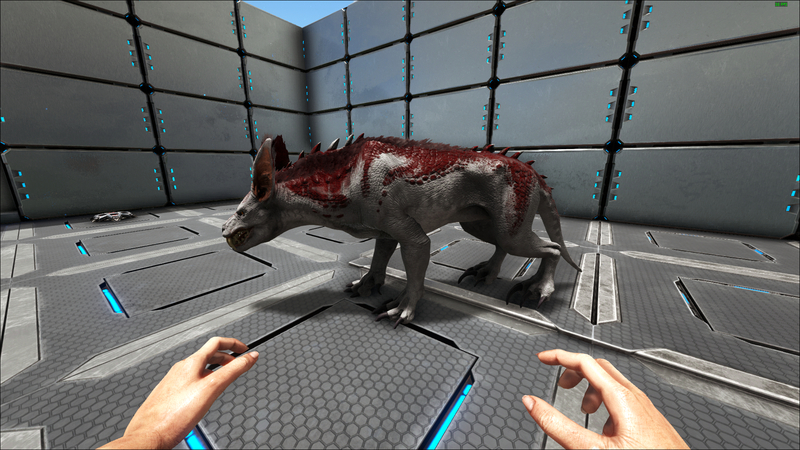 The Gnash attack is powerful and can even kill a Spino with ease as it induces a harsh bleed. They are able to climb player placed zip lines to get to you. Be cautious! They can easily be stopped by using a bola. You can use a Raptor to attack Ravager, make 2-3 attacks, run away from Ravager's attacks, heal and attack next time (similar strategy can be used on Raptors against every slower opponent). Megalosaurus, Carno and Spino can easily kill Ravagers. Using a Bola will make it stand still so it's easily knocked out, like a dire wolf tame or a sabertooth. The pack bonus on Ravagers makes them more difficult to tame so it is recommended that you bola the Ravager you wish to tame and either kill its packmates or simply lead them far enough away and lose aggro. Transport: Wood, Fungal Wood, Thatch, Metal, Green Gem, Fiber, Crystal, Obsidian, and Stone weigh less while being carried by the Ravager. These resources weigh only 50% of their usual value. The Ravager has a roar ability activated by pressing c, . Like the Direwolf it cannot roar while running. If you are on a zipline this will cause them to hang upside down. There is a saddle skin available for the Ravager. Similar to the Parasaur Founder saddle it adds a purple blanket-like piece decorated with the Ark "A" with studs on the saddle. The Ravager is capable of climbing across zip lines and vines. On console HOLDING DOWN while moving on the zipline increases the movement speed. Ravagers set to follow will follow you on ziplines. However to prevent them from jumping onto the zipline in front of you it is suggested to whistle stop, get on and move up the zipline, then whistle follow again. (Baby) Ravagers on follow will attempt to jump towards the nearest zipline to catch up with the survivor or dino they are following. When on a zipline on a Ravager, to operate the whistle radial wheel you need to use RS to select instead of LS. The second word of the Ravager's scientific name, Barghest, is actually the name of a creature (possibly a ghost) from English folklore which can appear in multiple forms, but usually takes the shape of a monstrous black dog. It's always considered an omen of death. The creature was first announced in the community crunch 102 at September 9, 2017. For some reason, Ravager's roar is simliar to Carbonemys's death sound. Like Allosaurus, when a Ravager roars, other pack member will also roar. Tamed and Imprinted Ravager do not inflict Gnashed. Ravager isn't immune to radiation.